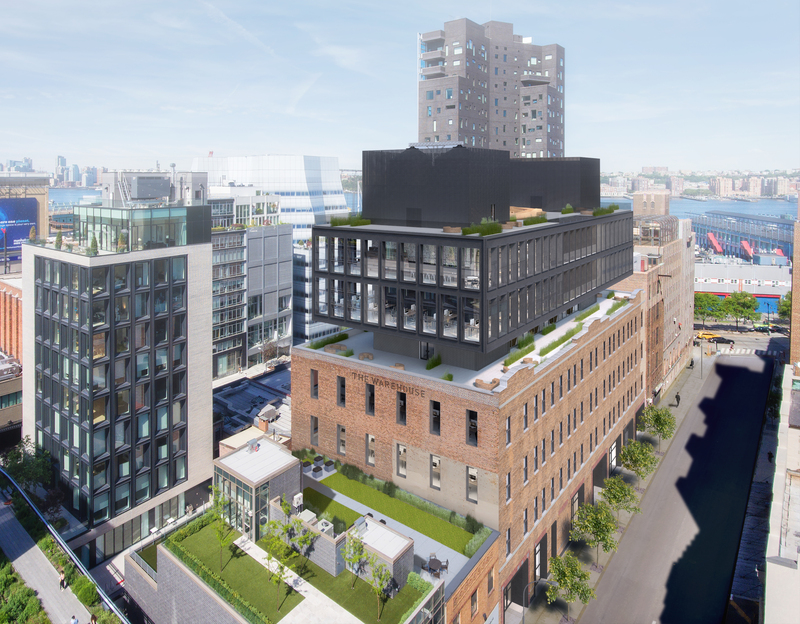 Designed by Morris Adjmi Architects,”The Warehouse,” is located at 520 West 20th Street, next to the High Line between West 19th and 20th Streets. The project topped-out late last year, and is being developed by Elijah Equities. Standing above the West Chelsea neighborhood, the existing 50-foot tall brick structure is being preserved and refurbished. 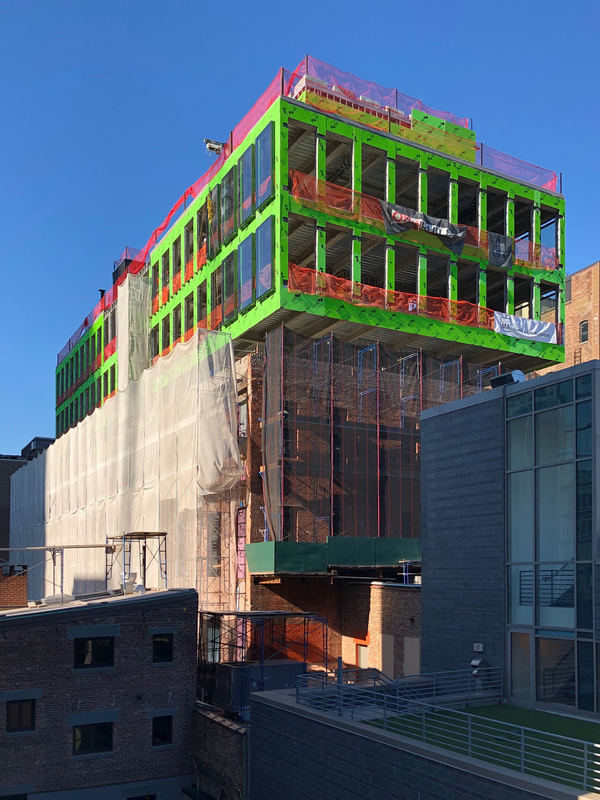 With the base now covered behind black and white-colored construction netting and scaffolding, work on the new three-story suspended and cantilevering metal structure up above continues atop the old roofline. When complete, The Warehouse will stand 105 feet tall. Two large mechanical and egress cores have been built, and are symmetrically placed by each end of the rectangular-shaped plot of land. 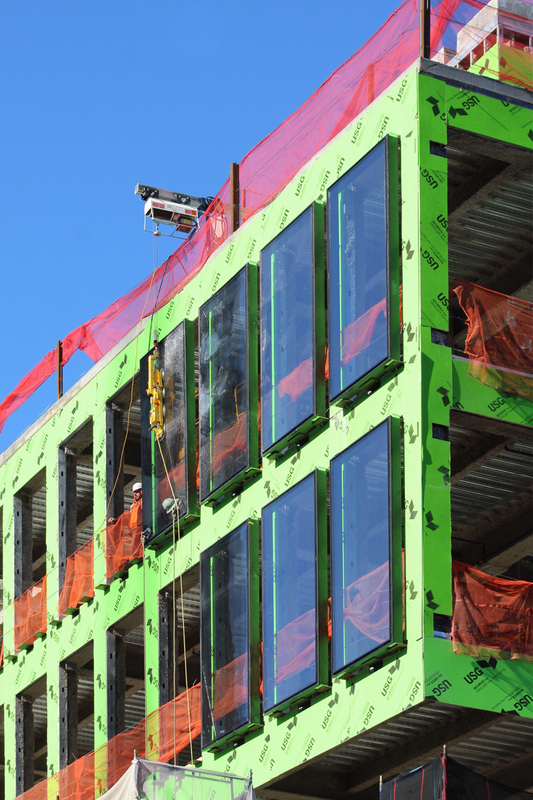 The top of each core will be covered with dark-colored exterior panels as seen in the rendering above. 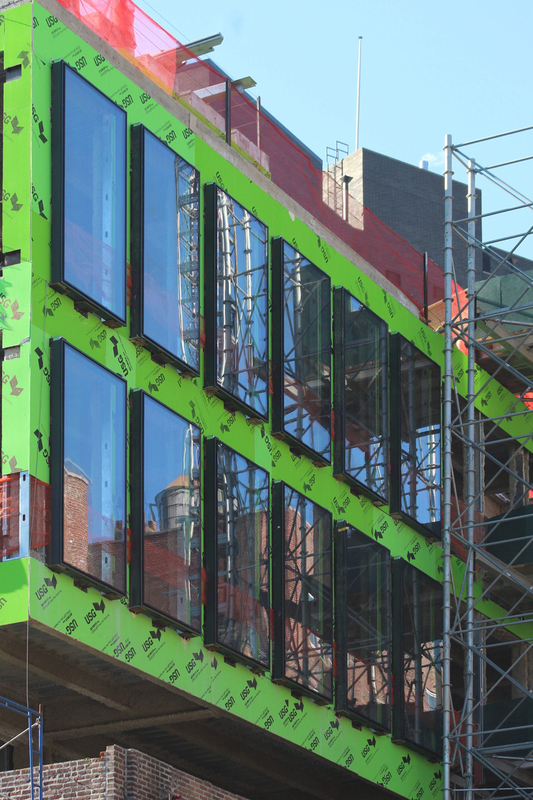 As the walls of the new addition begin to form, a good number of glass windows have already been installed. 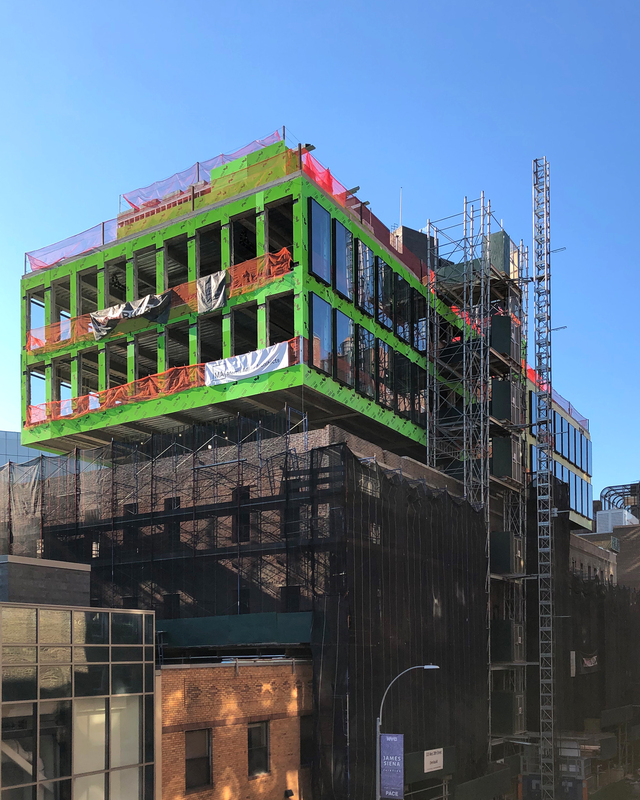 The northern elevation facing West 20th Street has nearly all panels in place except where the mechanical elevator is located. The ground floor will have retail and gallery space that opens up on along West 20th Street. This will become part of the nearly 80,000 square feet of commercial space. On the roof of the brick building and the new expansion, 18,000 square feet of outdoor space is planned for office workers to enjoy. Work on The Warehouse should be finished sometime before the end of 2019. 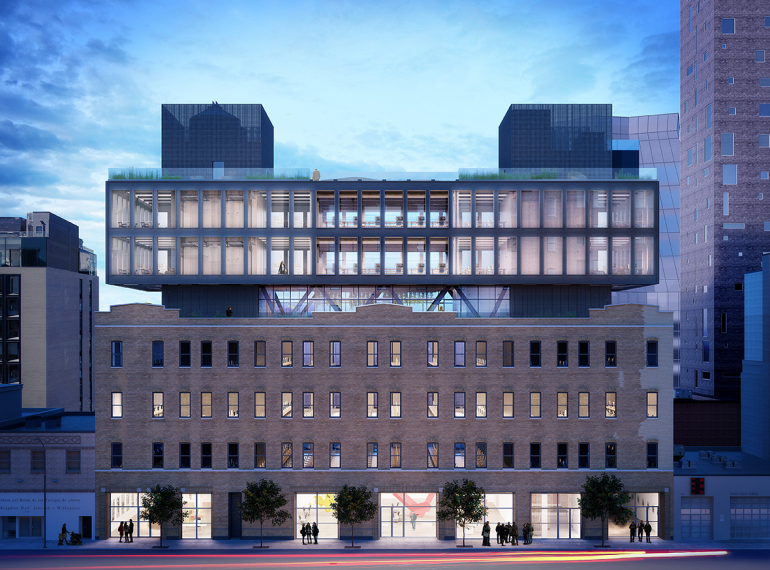 2 Comments on "Morris Adjmi’s Cantilevering 520 West 20th Street Making Headway in West Chelsea"